It’s really only just sinking in. 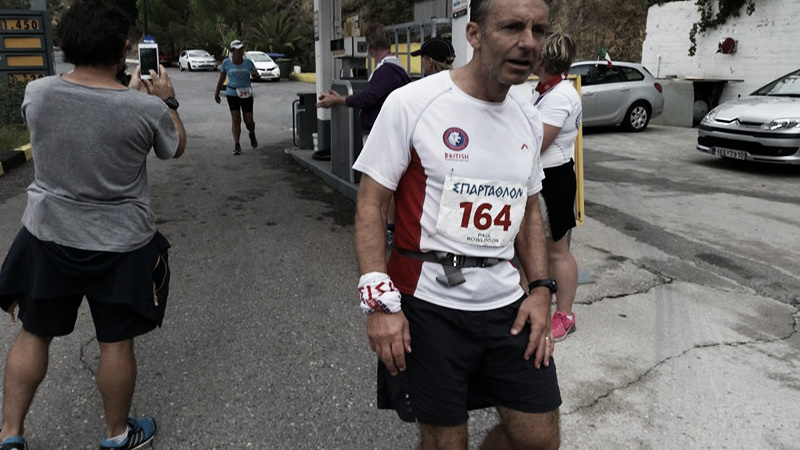 On Saturday I became the 67th Brit to finish the Spartathlon since the inaugural race 33 years ago. A lot of the last few days have taken on a dreamlike quality, especially in the race itself and at the finish. Exhaustion and dehydration played their part in that, and more of that later. The Spartathlon is by far the toughest event I’ve done. Effectively 6 marathons back to back in heat, over hilly ground with unforgiving cut-off times. It is the benchmark that ultrarunners the world over look to. The emotion I felt as I walked up the last 500m to the statue through raucous crowds is impossible to put into words. Kissing the feet of the King was a moment I have visualised every day for the last 2 years, ever more intensely since my failure last year, and I can’t think of another achievement that could top that feeling. The race itself breaks into 3 parts really – the first 81km dash to Corinth, then into the Peloponnese and up and over Mount Parthenion to Nestani at 173km, and final 73km shuffle/march to Sparta. We gathered at the Acropolis just before sunrise, 300+ from every nation, spirits high and ready for the 7am start. My first 40km went smoothly at a steady 4h20m pace, but as mercury rose above 30C towards midday, like a lot of people, I started to struggle. I made Corinth with only 25 minutes to spare, and felt spent. I couldn’t face food, and limped out of the CP feeling as though it was only a matter of time before the cut-offs caught me up and my race would be over. 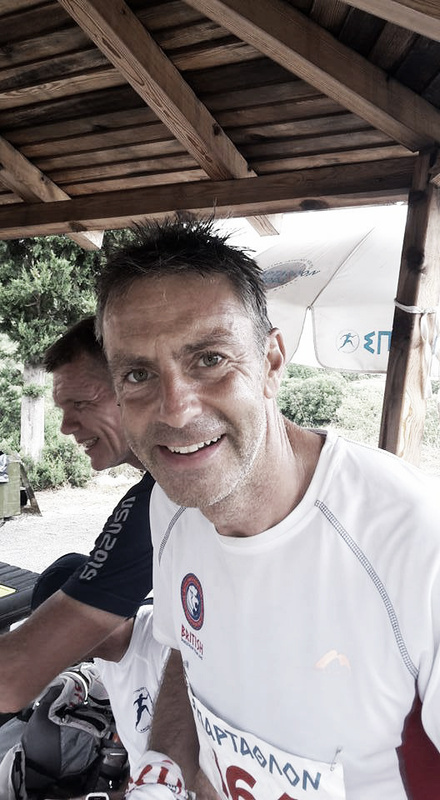 As I left Corinth I found a friendly face in 5-time finisher Martin Illott, who was also struggling. In his thoughtful and understated way, he said things that made me believe again and as the sun began to sink in the sky, my spirits rose and I felt strong enough to slowly put more time between me and the cut-offs that loomed behind. By the time I neared Nemea I felt much more confident, and 100x better than I had done at the same point in 2014. Now, my favourite animal is the Wolf. I knew there are Wolves in Greece, and towards midnight, I was treated to a sound I’ve always wanted to hear. Wolves howling in the night. It was thrilling, eerie sound and gave me a big boost. I felt privileged to this wild sound. I did have a little down moment and a quick puke a few km before Lykria, but recovered so that by the time I passed through Kapareli Village (CP45) in the early hours, the place where it had ended last year, I felt good. I reached the mountain base, and the weather had changed to cold, wind and rain. The rugged mountain path under foot and steep climb and descent played to my strengths, so that by the time I reached Nestani I had a 45 minute cushion on the cut-off. I’d been told that if you reach Nestani, the chances are you’ll finish. It isn’t that straightforward. I was lucky, because as dawn broke the sky was darkened by clouds, and soon the rain was teeming down. I pressed on after Nestani to build up more of a cushion and soon had over an hour to spare. But it really is a rollercoaster. At Tegea, around 195km I struggled to get food down and could feel it slipping away again. A couple of hours later, I felt fine, largely down to seeing a crowd of British supporters and also teaming up with Thomas Schmid, a cheerful Swiss who’d dropped at 202km last year. Disaster nearly struck as a wildly enthusiastic Nick Papageorge (a British supporter) almost knocked me off my feet with the greatest of bear hugs, before taking this picture. Wonderful support, even it if was like being hit by a Sam Burgess tackle. Further up the road, seeing my friend Sean Maley at the CP with just 19km to go was an emotional moment for us both – more hugs, and more strength from knowing how much your friends and teammates care. With 2 hours to spare, and only 5km to go I decided to walk it in. I was feeling a bit light headed and didn’t want to blow it at this point! The people of Sparti are some of the warmest and friendliest you could meet, and there were cheers, shouts and applause from every balcony, every shop and café and the children come out to high five you and walk with you. It’s a special place. And then you turn on to the final 500m, the avenue lined with flags of every nation, the crowds dozens deep and of every nationality cheering, clapping, hugging and high fiving you as you walk up towards the Statue. With most races, in the last few metres, you just want it to end. 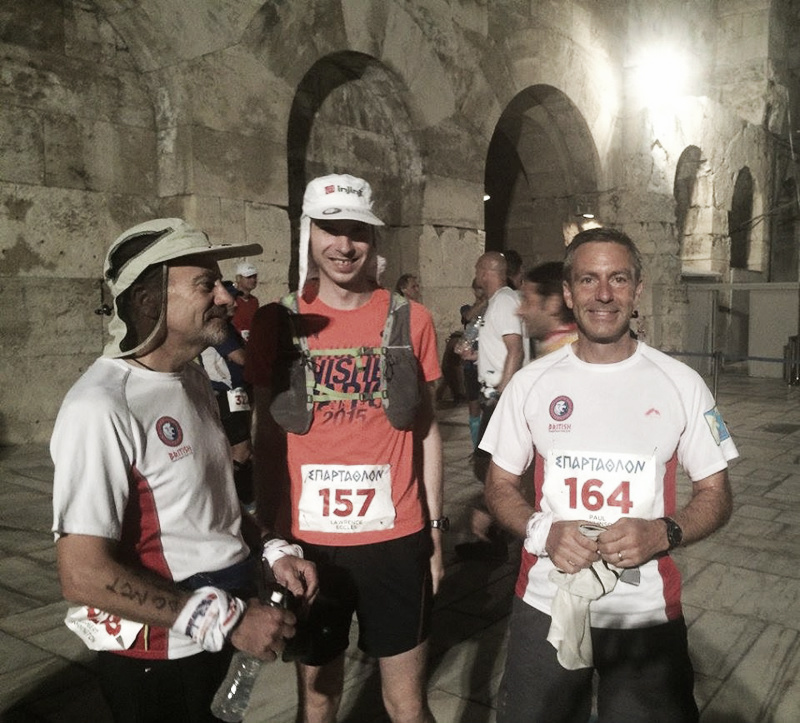 With Spartathlon, bizarrely, you DON’T want it to end. I’m not ashamed to say I was blinking through tears as I applauded the crowds before stepping up to kiss the feet, drink water from the River Eurotas and accept the crown of olive leaves. And when the finish was all done, I sat in the medical area and called my wife. She was treated to “Hi love! I’ve finished… hold on, I’m going to pass out…..” Probably not the most reassuring call I’ve ever made. I came to and, for a moment, I thought Zeus taken my soul and I was in heaven. It didn’t look too bad I thought, with several rather pretty young ladies gathered around me, smiling and looking concerned in equal measure. Nurses as it turned out, of course, and the IV drip sticking out of my arm reaffirmed the reality of the situation…. All-round top bloke Paul Ali came to look after me, and after the drip was all sorted they sat me up in a chair. It wasn’t down to Paul’s banter, but a few seconds later I had passed out again and puked over my blanket for good measure. So, laid out again, with another drip attached, it was well after dark before I was allowed back to my hotel for some precious sleep. It wasn’t the glorious walk to the bar I had planned, but it didn’t matter. 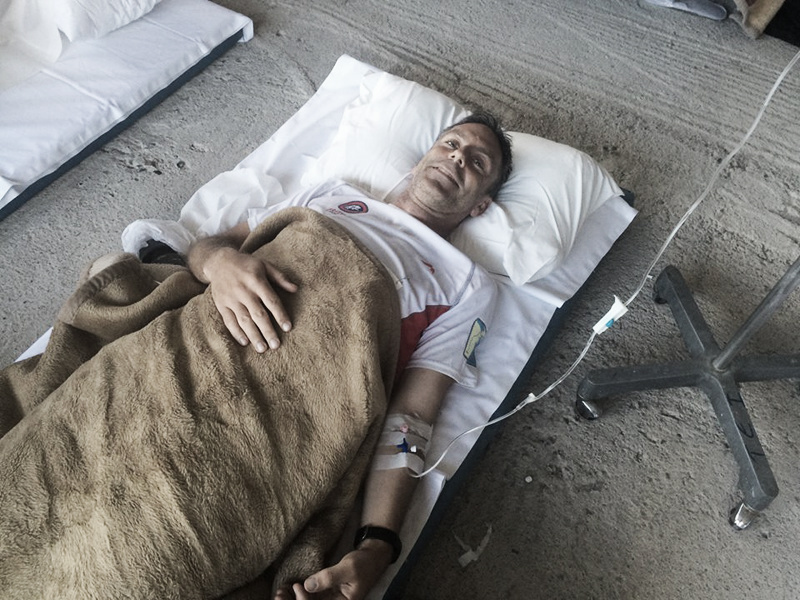 I’d done what I wanted – I’d finished the Spartathlon. Postscript – I drew Dan Lawson in the sweep stake, and not only was he first Brit home, he was 2nd in the race finishing in just under 24 hours. Absolutely phenomenal. I decided to put ½ the winnings into the team beer kitty, and give the other ½ to Dan to put towards one of the community projects he works on in India. He thanked me, and after a moment or two said that he had an idea. He organises a regular run for children in Goa, and the money would go towards funding that. It’s going to be called “Rowly’s Run”. Now that is something that is worth more than any medal!